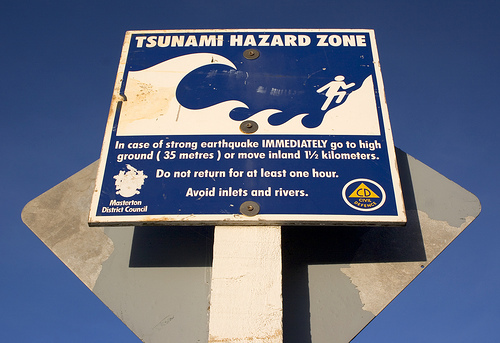 Tsunami waves initiated by the earthquake of 8.9 magnitude that hit Japan on Friday, 11th March 2011, has been experienced by almost all the countries in the pacific region, Though the extent of the force wasn’t that high. Recent news supporting this is coming from New Zealand, The biggest wave which touched New Zealand was of 1.6 metre high (from lowest point to the highest point) at Whitianga, in North Island, and Kaingaroa, on the Chatham Islands east of the mainland of New Zealand. New Zealand which is 8000KM south of Japan received the first wave after the 12 hours from the incidence in Japan. While at some parts the first wave reached early others part receieved them after prolong delay upto 40 hours. Experts believe this delay may be due to the bouncing of waves from different continental shelves all around the Pacific including even South America. While the height of wave was very much significant in New Zealand, even Antarctica wasn’t left out by the wave. Scientific bases on the white continent registered a 10cm high wave that was originated near Japan. Interestingly the height of waves in Taiwan was recorded just 50cm, seeing the continuous decrease in height China had even removed Tsunami warning. Indonesia has recorded one death due to Japanese Tsunami so far on 12th March. This long chain of islands of Indonesia might have protected Australian coast from Tsunami, this is the reason why New Zealand but not Australia recorded the wave. Scroll down and post your prayers for Japanese people in the comment form below.